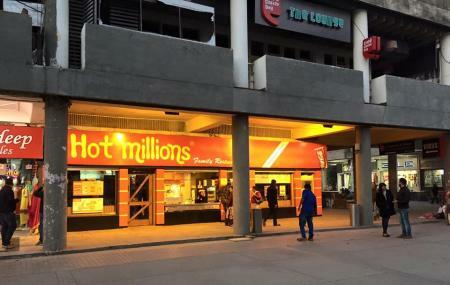 The Hot Millions is a delectable chain of Indian restaurant that offers authentic Indian, Chinese and Italian dishes with a twist of Indian spices and ingredients. The restaurant is unique in its design of a railway terminal. There are wooden chairs spread across the room and you can enjoy music and video games in a cozy ambience. There are over 186 menu items served here including the Mushroom Onion Cheese Pizza, Keema Cheese Pizza, Panir Burger, Fish Fillet Burger, Chicken Tikka masala, Kalmi Kabab, Butter Chicken, Chicken Tandoori, Dal Makhani, Masala Dosa, Manchurian Chicken and many more. Ice Cream sundae, milk shakes, fresh juices and cold drinks are also available. Their cake, muffins, souffle are made in house. Very brilliant place. My father used to visit in college days. Dosa is the best item. Cleanliness maintained properly. All services are provided. Every dish is so good and served very nicely. Really casual place. Visit with family. Good for children. Cozy place. Environment 5/5 Spacious and plenty of space to sit. I think it perfect for parties too. Staff is friendly Food 4/5 Burgers are good however when it comes to chicken burgers, veggies are missing plus the chicken doesn't taste that good but the veg burgers are pretty good.. This place isn't busy all the times except peak hours. If you want to have a bite be sure to manage time properly. Thanks to service I've never missed my lunch or class. This is an old fast food restaurant of Chandigarh with good quality of food. Quick service. Cheese Tomato and Butter naan is my favorite dish here. + Taste, Price, Location. -/+ Service, Gathering, Ambience. Still a nice place to hangout. Though the charm is lost but it is still maintaining the quality of food.